We’re happy to announces Freschetta gluten-free pizza as our latest sponsor. I must admit that I’m a little dubious about most frozen pizza. We make our pizza dough by hand every week for our Friday night pizza and movie parties. Once you start making it, pizza dough doesn’t seem difficult. However, I know that most people love a frozen pizza. After a week of making meals day and night for a week, plus snack for hungry kids, it’s a relief to have someone else cook for you. But sometimes you don’t want to go out for dinner either — too expensive, too much social interaction. Pop in a frozen pizza and turn on a movie with the kids. By Friday, that seems pretty darned appealing. And our KitchenAid freezer — another one of our sponsors — has a slot in it labeled “In-Door Pizza Storage.” Clearly, we’re not like most Americans. This country likes its frozen pizza. And we like Freschetta gluten-free pizza. It has ingredients I recognize. (It does have xanthan gum, for those of you can’t tolerate it.) It tastes of real tomatoes and cheese. It’s deliberately left simple so you can top it any way you like. Plus, kids like it. Every kid who has come into this house, gluten-free or not, has asked for more of this pizza. Lucy may have told us recently that she likes Freschetta gluten-free pizza better than she likes our homemade pizza. We laughed. Actually, I understand. She eats so little food from a package that the idea of eating good pizza, gluten-free, that comes from a store? SO exciting. Your kids will probably feel the same. Frankly, when Danny and I top our Freschetta gluten-free pizza with something interesting to use — slices of fresh basil and prosciutto, sautéed mushrooms and cauliflower, briny green olives and crispy coppa — and make ourselves a good side salad, like the fennel-cherry salad with cilantro-lime vinaigrette we’re offering below? We’re more than happy with this as our Friday night meal too. Freschetta is giving away some of their gluten-free pizza to three readers of Gluten-Free Girl. Please leave a comment about why you might like to try this pizza. Winners will be chosen at random on Friday, July 17th, and notified by email. The people at Freschetta asked if we could create a side dish to go with the pizza. You bet! This time of year, our favorite salad is one Danny made at a restaurant in Seattle called Cassis. 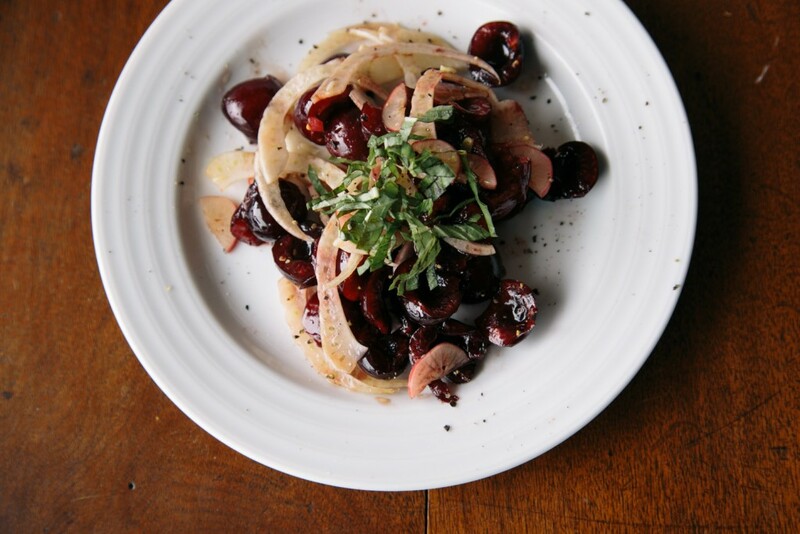 As soon as cherries came into season, he made this cherry-fennel salad for weeks. We offered this recipe in our first cookbook, Gluten-Free Girl and the Chef: A Love Story with 100 Tempting Recipes , made then with a raspberry vinaigrette. Tastes change: we never buy raspberry vinegar anymore. Instead, I like this simple lime-cilantro vinaigrette, the herb cutting the sweetness of the cherries, the lime amplifying their taste. If you don’t count the salt and pepper, we’re looking at seven ingredients for a great salad. Friday night, I have a big bowl of this and a couple of slices of pizza for movie night, and I’m satisfied. Make the vinaigrette. Pour the lime juice, olive oil, and cilantro into a blender. Blend until everything is emulsified and the cilantro entirely broken down into the liquid. Season with salt and pepper. Taste. Blend again. Make the salad. Combine the fennel, radishes, and cherries. Toss them with a drizzle of the vinaigrette. Taste. Add more, if necessary. Top with the fresh basil. Feel like playing? You’ll have vinaigrette left over. Aside from making this salad every day for a week, you could also use the lime-cilantro vinaigrette as the dressing for a quinoa salad or drizzle it over roasted chicken. Inevitably, of course, someone cannot stand cilantro. If that’s you, then try mint here instead. Pizza is one of the foods I miss the most since my Celiac diagnosis three years ago. I’d love to give Freschetta’s GF pizza a try! Thanks. We’d love to give this a try. My husband is only 2 months into his Celiac journey, and we’re still figuring out our new “normal” gluten free kitchen. A night off with a frozen pizza sounds great! I miss the convenience of frozen pizza. Thanks! Shauna, I am honestly confused. If xanthum gum bothers your GI tract, why promote products that have it? I thought your purposely removed it from all your recipes? There are many people out there who can tolerate xanthan gum. And they miss the convenience of foods like this. Our recipes are free of xanthan gum because we have realized it’s not necessary for great baking. However, our sponsorship program is a series of recommendations for the gluten-free community, far wider than my own needs. That’s why we sift through all the products we are sent and promote the ones that we feel are the best. Have you tested this pizza? Or just Lu and Danny? Either way, it sounds like a good and convenient option. In the post, it sounded like you ate the pizza for dinner and thought it was a great alternative to making the pizza yourself. But the pizza has one of the gums that I thought you couldn’t eat. Can you eat the gums in small, rare amounts, and did so when you ate the pizza? Or did just Danny and Lucy try the pizza? Not trying to be rude, just new to gluten free and I’m trying to understand the way this works. Thanks! Melissa, yes. I can eat small amounts of xathan gum occasionally. I have to try these foods we recommend or I wouldn’t feel right in recommending them. It’s hard to distinguish between allergies and aversions sometimes. I thought gums were on the same level as gluten for you, that any amount could make you sick. I would be surprised if you would risk that sickness just to endorse a frozen pizza! So far gums have been fine for me, so this should be an option for my family. Thanks! Oh no, the gums aren’t like gluten at all. It only takes 1/8 of a teaspoon of gluten to make me sick for 5 days. A little xanthan gum once in awhile is fine for me, but if I have it twice, I get gut issues. That’s true for many of us. I would love to try this for my four year old son. I make our own gluten free pizza for the whole family- though he’s the only one with Celiac. These would be so convenient for times we are going to a friend’s house, party, etc. I am pizza OBSESSED and would love to try this to satiate my weekend pizza cravings!!! First of all, thank you for the suggestion to try the freschetta GF pizza! I will definitely plan on that as an alternative to expensive pizza delivery/take-out. We also do homemade pizza and a movie at our house every Friday and often get invited to pizza parties were we are scrambling to find an easy and affordable option to bring for our GF family. This will be great! We have a 2 yr old and a newborn, and are in the middle of a move to our new house – so would LOVE to receive this pizza for our freezer during this hectic season!! I’ve been GF for 4 years now and have struggled to find a way to make pizza night at my house something I enjoy. I’ve been making my own pizza dough (the wheat based kind) for 20+ years and my kids like it better than anything we can get at a restaurant. So I’m not going to quit making pizza even if I can’t eat it. But then I’m sad on pizza night when everyone is having so much fun and I’m looking at my empty plate. I haven’t had much success making my own GF crust. I’ve found some good GF frozen pizzas but I am always ready to try something new, as long as there’s no sugar in this crust. That’s my only rule, LOL. My 7 y.o. and I are both GF and constantly on the search for easy and tasty food! We love pizza!! I would love to try these! My partner and I are always looking for quick and safe GF meals (made with real ingredients!) for nights we don’t feel like cooking. This sounds and looks amazing! I think it’s really difficult to find a good gluten-free pizza with decent base- would love to try it and see how it ‘holds up’! I would love to try this gluten free pizza. I recently just became diagnosed with being gluten sensitive so I am still looking for gluten free options to replace all the normal foods I was used to eating. I have yet to try a gluten free pizza yet so this would be great for me. There is something very appealing about being able to pop a pizza in the oven again. I’ve had good luck with Stark Raving frozen pizza, but I think I’d give this one a try too. Sometimes you just miss/need that convenience factor of food that tastes comforting with no labor involved! I’d love to try it! Thanks. There are just some days it is nice to have the option to pull a frozen pizza out of the freezer for a meal. Very interested to try this, looks like tapioca crust which I tend to prefer since they actually get crispy. And gluten free pizza cooking tip, especially if you are sending one off with your kid to be cooked by someone else… send a sheet of parchment paper with them and the pizza and have the pizza cooked on the parchment paper, either direct on the rack or on a pan. Means you don’t even NEED the pan, and paper helps keep it safe. We too have a pizza night (which we buy store bought – the local pizzeria is less expensive than frozen) except for their GF, which more expensive…but NOT tasty. 🙁 I have tried many GF frozen pizzas and have not found worth paying for!! It will be great to try Freschetta, it is my families go to pizza brand for frozen pizza already…how wonderful that they make a GF one….SUPER, SUPER!! So yummy! Love your photo showing what you can do to jazz up a plain cheese. Great idea! I do not have a gluten sensitivity. I do like good pizza. My friend can’t eat gluten so going out to pizza means buying a gluten free pizza and sharing it. I am usually disappointed with the taste, but it isn’t really about the pizza as much as the friendship (20+years! )I would love to eat pizza that tastes delicious and that she can eat with me. Being able to toss a pizza in the oven and watching movies without going out means more time with my very busy friend. I would love to try Freschetta GF Pizza! Would love to try this frozen pizza for those days when we have run 10 miles or are otherwise too busy or tired to cook. I love pizza and would like to find a frozen one that tastes ok! Although we love our against the grain pizza it is getting difficult to source here in rural Idaho. It would be so nice to have a more national brand for convenience. I would very much enjoy trying a brand we used to eat regularly before we went gluten free. I used to love this brand before I had to go gluten free and have never tried the gf version. I didn’t even realize they made one! I’d love to try it. I’ve been making pizza from scratch using a gluten free flour mix tat I also use for baking bread. We prefer homemade pizza but it is a labor of love. 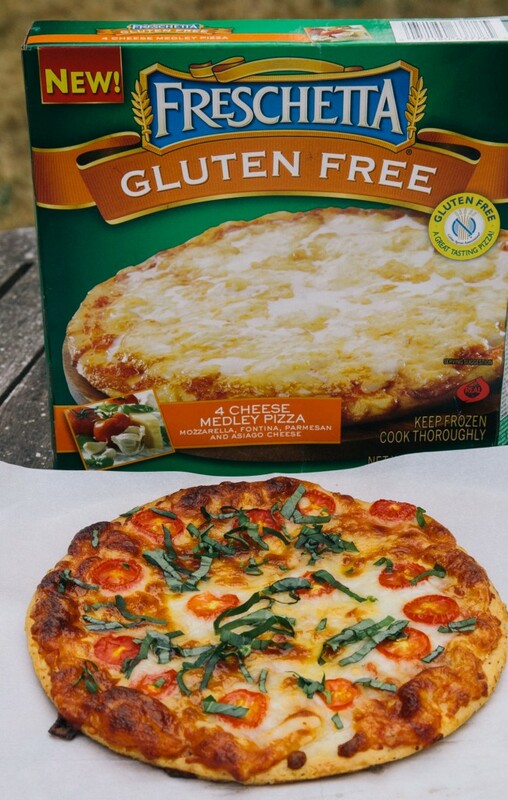 It would be great to find a gluten free frozen pizza to just pop in the oven for a quick meal. We would love to try the Freschetta frozen gluten free pizza. Pizza is what I miss the most since having to go GF. I have tried a few other brands of GF crust and they just aren’t very good. I have also tried making GF crust from scratch, but it just doesn’t seem worth it. I truly can’t wait to try Freschetta GF pizza! I would love to try it! I’ve tried some frozen gluten fee pizzas and they are chewy. I would love to find a great-tasting gf pizza! I would love to try this pizza! I don’t like many of the gf frozen pizza crusts. Maybe I will like this one! I would love to try this pizza! My 9 year old daughter is gluten free and I think she would love this! Having been recently diagnosed with Celiac, I am excited to try a frozen GF pizza. I’ve tried this and it’s actually pretty good. I love that I can reliably find it in my local grocery as well, since it’s a well-known national brand. I fancy mine up with some fresh cut vegetables. My daughter is gluten free and loves pizza. This would be a great treat for her. Thanks for offering this. I used to buy this brand before I was diagnosed with Celiac. I’d love to try their gluten-free pizza. It would be really handy on busy nights. I’d love to be able to have an emergency meal idea in the freezer, and pizza is something I love! Don’t eat much frozen pizza because it is mediocre. Looking forward to trying this. Pizza is my kids favorite foods but we don’t have it too often because I end up buying and cooking three different pizzas due to different likes. I think I might be able to pull this one off as a regular pizza for my oldest that isn’t gluten free. I have been looking for a good frozen gluten free pizza. I like homemade the best as well, but sometimes you just need something easy! I would be interested in trying this pizza. The crust looks nice and puffy instead of flat. I think it is great that there may be an option for many who need to be gluten free. I have other health issues in addition to a wheat sensitivity, so I won’t be able to try this pizza. I have found that Against the Grain pizza crust hands down beats ANY pizza crust made with rice flour. And no xanthan gum! Sunday nights were always homemade pizza night prior to my Celiac diagnosis. I have not been able to master a gluten free recipe that my family loves. I had several pregnancy losses prior to my diagnosis and then took a year off to heal. I am pregnant again and hoping that a strict gluten free diet will allow a successful outcome. The food that I have been missing and craving most is pizza. The convenience of a delicious frozen gluten free pizza after a long day would be amazing! I’d love to get some to share with a gluten free friend! To be quite honest,I always choke on the cost of frozen GF pizza, so free ones would be lovely! 4 young kids of which 3 have Celiac Disease which they got from me, their Mom…need I say more?! Frozen pizza that tastes good and is GF would be heaven sent! I will have to try this for my daughter. She has recently discovered she can no longer eat gluten. We have been looking for a tasty gluten free pizza. I would love to share this pizza with my brother, who was recently diagnosed with celiacs disease. Looking forward to trying this. Always excited to have an option for when I don’t have time to cook and need a quick dinner and pizza is always a welcome treat. I’ve tried a variety of frozen GF pizzas and have yet to find one I like. I’d love to try this one! Those pies look amazing. It would be nice to be able to pick up some frozen gluten free pies at the supermarket instead of walking on by. And you have singles! Solid lunch time meal. I love the idea of feeling “normal” by eating a GOOD tasting frozen pizza! And it would be great to be able to serve at parties …. I’d love to keep my kitchen entirely gluten free, while being able to treat guests at football parties to pizza even gluten eaters can enjoy. I loved Freschetta Pizza when I was younger. I’ve seen the gluten free variety, but haven’t yet tried it. I’d love to see how the gluten-free style compares to my memories of gluten-filled Freschetta pizzas. I would love to try this pizza because my daughter and I both and have celiac disease and sometimes I just don’t feel like cooking! I will have to look for this brand the next time I am shopping. It looks and sounds delicious. Generally I don’t buy frozen pizzas because most of the ones I have tried are just awful. I make my own crust, but this one actually looks like something I would buy and like. If it passed the Lu test, it’s worth trying. The salad sounds absolutely delicious. Thanks for sharing. This is such a great option for gluten free families! I am new to this and having a quick dinner would certainly be handy. Thanks! I’ve only met one gf pizza crust I’ve loved and that was at a restaurant. I’d like to find one that I can enjoy at home. I would LOVE to try this..I’m always looking for a really good gluten free pizza and there aren’t a lot out there but not a lot that are good. Anything that y’all will stand by my guess will be that it’s good! I would love to be able to try this pizza! At $10 a pop in my local stores, it’s not something I have been able to splurge on yet for my family of five, but it looks so tasty!! My son would be more than thrilled to try this. He’s so used to hearing that he can’t have something when we go grocery shopping, that he really latches on to the packaged items that he can have. I’ve seen this in stores, but haven’t tried it yet. I’m glad to hear that it passes the test in your house. I’ve had so many hit and miss experiences with frozen pizza (more misses than hits) and it would be wonderful to give this brand a try! It sounds like the perfect renewal to my family’s long forgotten pizza nights. Oh how I miss good pizza! That looks delicious. I would love to try it. I am just embarking on the gluten free journey…. about 3 weeks now. One of the foods I LOVE is pizza, so it would be wonderful to try this!! wow. my 8 year old and husband suffer through my many attempts to make GF pizza crusts. they are so patient and eat the good ones and the lousy ones. this new pizza looks like a shortcut to family happiness!!! Clearly the idea of you feeling “like most Americans” is off putting, however, having lived in Europe for the last 11 years, I wish I had the luxury of space or could even afford a giant fridge/freezer that would offer such a thing as In-Door Pizza Storage. I AM American and have never seen such a thing. But I have had the same old fridge for twenty years now. Must be a recent development! I’m sensitive to xanthum gum and lactose intolerant. It would be great if I could eat this. I gather you, Danny and Lu all enjoyed it with no tummy issues? Wonderful news if so, I will give it a try. Oh, Shauna. I wish you would just be true to you. I’ve been reading your blog for years and seeing you sell your soul to a company like Freschetta just breaks my heart. I understand the need for money, but in the eyes of your readers, I have to say that it is obvious that you really don’t enjoy recommending this company. I would never buy their mass produced product, gluten free or otherwise, and I don’t think you would either, had they not paid you to recommend them. Credibility does mean something in this day and age. Jessica, I’m afraid we’re going to have to agree to disagree. There was no selling of the soul here. Lucy truly does love this pizza. So does every kid who comes in the house. Why would I not recommend a good gluten-free food, certified gluten-free by the Celiac Sprue Association, meant for kids and people who need a little lift sometimes? Frankly, ten years ago, when I was first diagnosed, there were so few gluten-free foods on the market that I reached for anything that said gluten-free. Now, we have our choices. And we will buy the Freschetta gluten-free pizza for Lucy occasionally when it hits our grocery store. (The ones we tried and photographed were sent to us by the company as part of the sponsorship program.) Our sponsorship program is meant to be a series of recommendations, rather than running whatever ads come up randomly on an ad network. We want our work to be of use. And our sponsorship program is intentionally meant for a wider audience than just our home. We try out different products for our readers. Yes, it’s part of our income, but we turn down about 90% of the products we try. That’s why I can say quite clearly that we recommend this pizza. If you don’t like the pizza, that’s entirely up to you. But as you can see from the other comments, there are plenty of people who are excited about this pizza. I’d love to try this pizza because, pre-diagnosis, I’d often pick up a box of Freschetta on my way home from work Fridays. Would be delighted to have that convenience again; other frozen GF pizzas haven’t been very tasty! Friday night is pizza night at our house and Wyatt, my 5 year old Celiac pirate, looks forward to that night all week. In reality, all five of us do, but Wyatt has a bit of an obsession with pizza. As a mom of three small kids, I prefer popping a couple of gluten free pizzas in the oven, for convenience sake, but there are limited choices in local grocery stores for good tasting, gluten free pizzas that won’t break the bank. (That last point is particularly important when you have a family of five who all eat gluten free.) We’re hopeful that Freschetta gf pizza will hit the mark… and would love to try your pizza on an upcoming Friday night! Always on the look out for a good GF pizza. I love that I can top it to my liking and pop it straight into the oven in minutes. Some days that’s just what I need. I think it’s better than udi’s. very good gf pizza. I always like to have a frozen pizza on hand for when I need a quick dinner. This is one brand I haven’t tried yet. And I believe my grocery store sells it. I have been disappointed in gluten free pizza lately (I think every restaurant uses Udi’s crust and it isn’t my favorite). So, I would love to try this one! I would love to have my 3 year old who is sensitive to gluten try this pizza! I’ve been wanting to try this pizza for quite some time! I usually make my own pizza dough, but there are still days that I just don’t have the energy and a good, quick meal to go to would be great to have. Also for when I’m away from home and need something I know will be safe. The salad looks great too! Definitely need to try that some time soon. I love pizza. And I can’t eat gluten. I look forward to trying this brand. Ciao. I’m new to this mind boggling GF life. So excited to find gluten free girl and to read about GF pizza! I miss pizza and can’t wait to try this gf pizza!!!!! First of all, I’d like to say how happy I am to found your blog! Gluten/nut-free died is very new to me and I am trying hard to muddle through the information I am finding. I am very excited to see this post. I hope that this product is at one of our local stores. I’d love to try it. I like that it’s plain and you can add your favorites to make this pizza. Your regular pizza was always one of our favorites- and now gluten free for a couple of years, well, WE ARE DYING TO TRY YOUR GF PIZZA! We promise to give you valuable feedback as we have tried a number of brands that simply didn’t meet our standards. We’re waiting with much giddiness. Thanks in advance. I am 3 weeks new to gluten free and I took my first trip to the store to see what was available in gluten free. I loved the regular Freshetta Pizza and was happy to see GF Freshetta. I could not tell the difference. I bought several Betty Crocker mixes, to get started on my new adventure. I had Weber Christian Disease (rare auto immune disease) when I was 17 and since that time I have battled with extreme and constant swelling of my feet… Poor vein circulation. A Naturapath recommended I try gluten free … I have tried many things and said “Why Not.” After 3 weeks I am able to wear shoes I wore several years ago. Luckily I do enjoy food preparation and baking and will not always use boxed mixes. I look forward to learning more on your web site.